BooksAaker, Jennifer and Andy Smith (2010), The Dragonfly Effect: Quick, Effective, and Powerful Ways to Use Social Media to Drive Social Change, San Francisco, CA: Jossey-Bass. BooksAcs, Zoltan J. and David B. Audretsch (eds.) (2nd ed. 2010), Handbook of Entrepreneurship Research: An Interdisciplinary Survey and Introduction, New York, NY: Springer. 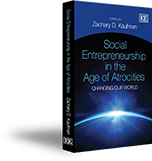 BooksAlcacer, Juan and Ozgur Demirtas (2011), Understanding Social Entrepreneurship: The Relentless Pursuit of Mission in an Ever Changing World, New York, NY: Routledge.